Not only did the tragedy that was Sept. 11, 2001 mark the beginning of the War on Terror and some of the biggest changes to airport security in the history of airport security, but it also sparked some of the strangest myths and urban legends surrounding a major tragedy in the United States. Unfortunately, when human-caused destruction of that size happens, people can be more willing to believe outrageous stories or photos if they're searching for explanations or stories to match their confused and horrified emotions. 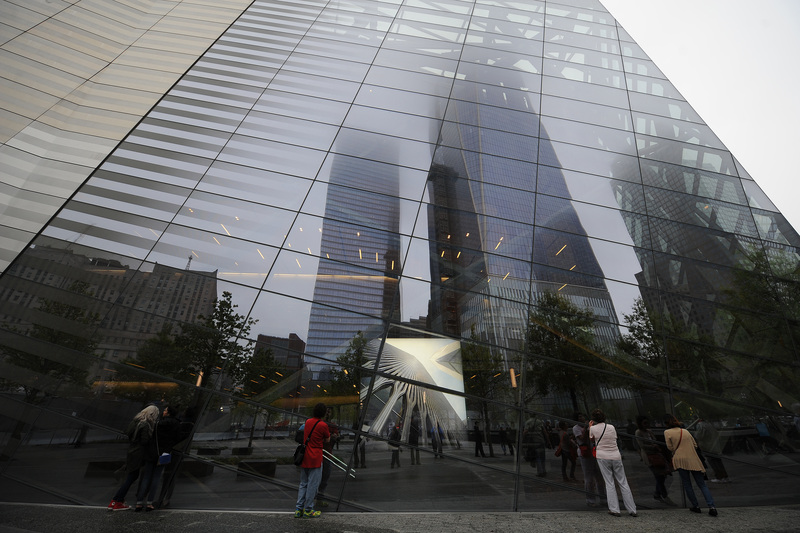 There are a number of crazy 9/11 myths and urban legends that still persist today. Most of them are weird and outlandish, and all of them are downright wrong. There are 9/11 conspiracy theories, which are also bizarre, and then there are 9/11 myths that often began as viral photos or stories and weren't properly researched and explained until they had already spread like wildfire. Many 9/11 myths have been shut down on the internet in the 14 years since the tragedy, but there are some that still persist, because the Internet is a strange and scary place. Here are four of the most common myths that some people still believe about Sept. 11, with explanations of what really happened. A little more than a week after the 9/11 attacks, the above photo arrived in email inboxes across the country claiming it was the "last tourist photo" ever taken atop the World Trade Center, just seconds before a hijacker flew a plane into one of the Twin Towers. But, according to Snopes.com, a website that disproves rumors, there are a number of problems with the photo that prove it was digitally manipulated. First, Sept. 11, 2001 was a sunny, late-summer day, meaning it wasn't the kind of weather that required a heavy coat and a winter hat. Second, the plane shown in the photo is approaching from the north, which means it would have been the plane that hit the north tower of the World Trade Center, called WTC1, if it were actually an accurate photo taken on the day of the tragedy. But, WTC1 did not have an outdoor observation deck, according to Snopes. Third, the observation hours (presuming the photo was somehow possible from WTC2's deck) didn't start until 9:30 a.m., and the first plane hit the WTC at 8:49 a.m. Lastly, the aircraft shown is a Boeing 757 with an American Airlines marking. The only American flight to crash into the towers was a 767, according to Snopes. The short poem was attributed to Nostradamus and claimed to be from 1654. Many people believed — and some still believe — that it was a prophetic prediction of the 9/11 attack, with "City of God" referring to New York City, "Two brothers" referring to the World Trade Center towers, "the great leader" referring to the United States, and "the third big war" referring to the resulting war in the Middle East. But Nostradamus died in 1566, according to About.com, and a quick web search showed that the poem was actually written in 1996 by a college student named Neil Marshall. Days after the 9/11 attacks, media reports surfaced that Pasquale Buzzelli used a piece of debris as a makeshift boogie board to surf down 15 to 80 stories of debris, according to Snopes. There are actual news videos about the man, whom some people still believe really did survive a "surf" down that much wreckage with minor injuries. This rumor was what Snopes called an "expression of hope" that some people who were stuck higher up in the towers had miraculously made it out alive. Though Buzzelli did survive, the idea that he was 80+ stories up and somehow surfed to his safety is untrue. There are a number of stories about firefighters and Port Authority police officers who miraculously escaped and survived even though they were on one of the towers' higher floors, but later reports all showed that these people were actually located on the ground floor of the towers before their collapse. According to Snopes, Buzzelli actually reached what he believed was the 22nd floor by the time the building collapsed. He was knocked unconscious but then came to a few hours later, when he was discovered on top of a high pile of rubble by firemen and was rescued. Buzzelli never claimed that he surfed down the debris, so his story was mixed with the strange stories of firefighters who were thought to be stuck higher up in the towers and somehow survived. Subject: FW: ScaryOne of the planes that hit the trade centre towers was flight number : Q33NY1) Open a new Word document and type in capital letters Q33NY2) highlight it3) enlarge the font to 484) click on Font Style and select "Wingdings"You will then will be amazed!! If you actually perform the described action, then you will see a photo of what appears to be a plane, two buildings, a skull and crossbones, and the star of David (the star of David was thought to represent Israel, which is one of Al Qaeda's enemies). People who believed that there was some kind of government conspiracy at the center of 9/11 often used this strange Microsoft occurrence as justification. But this is yet another untrue myth. Neither of the flights that hit the towers had a flight number of Q33NY, nor a tail number or identifying number that was at all similar, according to About. The weird trick was thus deemed a deliberate fabrication by someone too familiar with Microsoft.